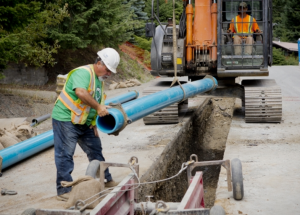 You should read this if there is going to be any work on the water mains in your street or on the metal water service pipe feeding your property. The service pipe is the pipe that runs from the water main into your property. In older properties this pipe was often used as part of the electrical system to provide an earth to the property. Until 1966 most earthing connections were made to an earth electrode buried in the ground. However, in many cases the incoming metal water service pipe was used as an alternative to an earth electrode. This method of earthing was seen as safe, as long as the incoming metal water service pipe remained intact. This practice is no longer allowed mainly due to the fact that most service pipes are now plastic and do not provide an adequate earth for the safety of the electrical system. People will often mistake the earth bonding conductor for the main earth and assume incorrectly that the property is earth to the water pipe. Correct earthing and bonding is vital for the safety of a property’s electrical installation. If your property just relies on the old metal water service pipe as an electrical earth, it might not be earthed safely when the work is finished. Plastic pipes cannot provide an electrical earth. In all modern property’s electrical installations are connected to an earth point, usually at the electricity meter. Property owners are responsible for making sure that the earthing and bonding is safe and effective without relying on the incoming metal water service pipe. The water company does not accept responsibility for your electrical installation, or for the cost to bring your property’s earthing and bonding arrangements up to the safe standard needed by current regulations. 4 If you need more advice. You should get a competent registered electrician to inspect your electrical installation and advise you about any work needed to bring your property’s earthing and bonding arrangements up to the standards needed by current regulations. Your Local Electrician in Staines, Sunbury & Shepperton and I would be happy to carry out an initial inspection of your earthing arrangement for a small fee of just £35. Should your property’s earthing system require upgrading a full upgrade can be achieved for a fixed Price of £85 .